Asset securitization is another changllenging discussion in accounting and financial world. I challenged myself to this topic, would you? Consequently a long research consumed to gather all this information. I hope this post contrubutes well to your knowledge. But before the deep discussion, I would like to start it by rising a simple question: What is securitization? Well, securitization is the process of transforming predictable cash flows into securities. These securities are tradable and have greater liquidity than the cash flows themselves. Thus, securitization facilitates the creation of markets for financial claims that would otherwise not be marketable. Securitization also allows for the repackaging of cash flows into different buckets (also called tranches) with respect to seniority and timing of repayment. Tranches are sized to minimize funding costs within the needs and requirements of investors. For investors, securitization makes it possible to invest in tradable financial claims with attractive returns. For borrowers, securitization provides an alternative funding source with lower costs of funds compared with other forms of financing. By playing a role in improving the efficiency of the financial system and increasing credit availability, securitization is an integral and vital part of today’s economy. In a typical asset-backed securitization, the transferor (also known as the “sponsor” or “issuer”) bundles together financial assets (e.g., accounts receivable or loans) from a number of customers (or borrowers). The sponsor then forms a special-purpose entity (SPE) (sometimes referred to as a special-purpose vehicle or a specialpurpose company) to buy the assets from the sponsor. 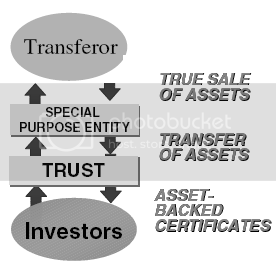 In most structures, a second transfer of the assets to a trust occurs and the trust issues the asset-backed securities. It is the combination of the two entities and transfers (a two-step transaction) that typically is necessary to accomplish legal isolation. The issuance of the asset-backed securities provides funds for the purchase of the receivables from the transferor. Such securities are in the form of beneficial interests in the receivables or the cash flows the receivables will generate and, accordingly, are backed solely by the assets in the trust due to the legal isolation. Beneficial interests may comprise either a single class of securities having debt or equity characteristics or multiple classes of interests, some having debt characteristics and others having equity characteristics. The sponsor also may retain an interest in the assets transferred (e.g., the residual interest) and may service the receivables, performing such duties as collecting principal and interest from the customer (or borrowers), investigating delinquencies, foreclosing and liquidating collateral of defaulted loans and remitting principal and interest to the asset-backed security holders, guarantors, trustees or others that provide services for the structure. Beneficial interests: Rights to receive all or portions of specified cash inflows to a trust or other entity, including senior and subordinated shares of interest, principal, or other cash inflows to be “passed-through” or “paid-through,” premiums due to guarantors, commercial paper obligations, and residual interests, whether in the form of debt or equity (FASB Statement No. 140, paragraph 364). Financial asset: Cash, evidence of an ownership interest in an entity, or a contract that conveys to a second entity a contractual right (a) to receive cash or another financial instrument from a first entity or (b) to exchange other financial instruments on potentially favorable terms with the first entity (FASB Statement No. 140, paragraph 364). Interest-only strip: A contractual right to receive some or all of the interest due on a bond, mortgage loan, collateralized mortgage obligation, or other interestbearing financial asset (FASB Statement No. 140, paragraph 364). Qualifying SPE: A special-purpose entity that qualifies for specific accounting treatment under FASB Statement No. 140. Special-Purpose Entity: A legal entity with a specific, limited purpose. Transfer: The conveyance of a noncash financial asset by and to someone other than the issuer of that financial asset. Thus, a transfer includes selling a receivable, putting it into a securitization trust, or posting it as collateral but excludes the origination of that receivable, the settlement of that receivable, or the restructuring of that receivable into a security in a troubled debt restructuring (FASB Statement No. 140, paragraph 364). Transferee: An entity that receives a financial asset, a portion of a financial asset, or a group of financial assets from a transferor (FASB Statement No. 140, paragraph 364). Transferor: An entity that transfers a financial asset, a portion of a financial asset, or a group of financial assets that it controls to another entity (FASB Statement No. 140, paragraph 364). The securitization structure is intended to provide significant advantages to the originator of the financial asset, which includes providing an alternative source of funding, reducing cost of funds, creating risk transparency, and increasing the return on asset and return on equity by moving the assets and related funding off balance sheet. One of the greatest advantages of securitization is the creation of tradable securities from illiquid financial claims. In many cases, originators are limited to a few sources of funds such as unsecured debt, asset-based funding, or sale/syndication. These types of financing usually carry higher costs than securitization as it relies on the creditworthiness of the originators rather than on the financial claims. Securitization of financial claims also provides the originator with a way to receive payment for the financial claims earlier than the scheduled collection date of those financial claims. This helps originators to carry on their business and to generate new financial claims. In the financial markets, higher-rated debt commands lower rates. Through the isolation of the financial claims in a “bankruptcy-remote” entity, asset diversification, tranching, and overcollateralization, securitization provides for the issuance of highly rated securities and, in many cases, securities that are rated higher than the originator itself. This tends to reduce the costs of funds to the originator when compared to traditional forms of financing. The “bankruptcy remoteness” of the financial claims is an important factor in the ability of the originator to offer the securities at lower rates. The fact that an investor’s claim over the cash flows of the assets is not exposed to the originator’s other obligations, which emerge from the originator’s possibly risky ongoing business, makes it possible for the rating agencies to look to the financial claims quality and not the originator’s credit quality in assigning ratings. This could be significant in many cases to companies that carry ratings lower than “AAA” and could raise cheaper funds through the process of securitization. Savings from securitization increase as the originator’s rating decreases. However, it should be noted that the spread saved through securitization could widen or shrink at different points in time as a result of the economy and the company. The predictable nature of the cash flows of financial claims allows investors to measure risk associated with their investment more easily and with greater accuracy. In addition, in many structures, assets and related liabilities can be matched, eliminating the need for hedges. In many securitization transactions, the financial claims and related funding are moved “off balance sheet” and replaced by cash and other assets. This helps improve the originator’s balance sheet and the financial ratios used to measure the originators’ financial health. For example, securitization allows banks to release capital and reduce the reserve requirements by exchanging illiquid financial claims, which are considered to be the risky assets, for cash and unrated first loss securities. This in turn increases the bank’s lending abilities and, subsequently, its profitability. A securitization transaction typically starts with an originator’s1 decision to securitize its financial assets. The originator then selects an underwriter and together they assemble the rest of the financing team. The underwriter and issuer coordinate the assembly of a collateral pool and related data. The rating agencies or financial guarantors then determine the required credit enhancement. The attorneys draft legal and disclosure documents. During the evaluation phase, the originator determines whether securitization is the most appropriate option [e.g., would asset based funding or a sale/syndication provide better economics?] and identifies any issues that need to be addressed [e.g., can the systems provide the required information?]. Once securitization is chosen, the transaction is structured, the optimal assets are selected, and the rating agencies perform due diligence. It generally takes between eight to sixteen weeks to close a transaction, depending on such factors as whether the deal is public or private and the availability of data. The securitized pool of assets will need to be tracked separately from other assets serviced by the servicer. Most securitization structures involve the sale of a pool of financial claims by the originator to a “bankruptcy-remote”, wholly owned special-purpose entity in a manner that qualifies as a legal “true sale”, 2 in exchange for cash and retained interests in the financial claims (generally the residual interest). The SPE then transfers the financial claims to a trust or other type of special purpose entity, which credit enhances the pool to obtain the high credit rating sought by thirdparty investors on their interests. The credit enhancement can be provided in a variety of ways such as by establishing a spread account (in which certain collateral collections are retained in the SPE to support repayment to the investors before being distributed to the originator), by purchasing a financial guarantee (wrap), or using a senior/subordinate structure (in which the subordinate holders’ financial interests are junior to the senior holders—that is, the subordinate holders assume more of the economic risks). The trust that issues the securities transfers the cash it raises from investors to the first SPE, which simultaneously transfers the cash to the originator. Typically, an SPE has the following characteristics: an entity that is created to accomplish a narrow and well-defined objective (e.g., to effect a lease, research and development activities, or a securitization of financial assets) that takes the form of a corporation, trust, partnership or unincorporated entity. SPEs often are created with legal arrangements that impose strict and sometimes permanent limits on the decision-making powers of their governing board, trustee, or management over the operations of the SPE. Frequently, the provisions specify that the policy guiding the ongoing activities of the SPE cannot be modified, other than by its creator or sponsor (i.e., they operate on so-called autopilot). As a result, SPEs do not typically have employees or the day-to-day operations of a normal corporation. The originator will usually be the servicer of the financial claims, as it already has the resources and expertise necessary to manage the financial claims. During the term of the transaction, the servicer bills and collects payments on the financial claims, on behalf of the SPE. I know, accountants more concern to the accounting aspects of any economic events, so do asset securitization. On my next post [Accounting Aspects Of Asset Securitization], we will discuss every side of asset securitization from the accounting point of view. We will answer many questions and accounting issues arise in term with asset securitizations, such as: should transfer of assets in a securitization should be accounted for as a sale or a secured borrowing? And many various accounting issues around it, asset securitization criteria, decision tree of asset securitization and many more! Related Topics:Alternative Source of FundingAsset SecuritizationAsset Securitization ProcessAsset Securitization Terms and DefinitionsCost of FundsOff Balance Sheet FinancingRisk TransparencyStructural Aspects Of Asset SecuritizationWhat is Asset Securitization?What is Asset Securitization? [Basic Overview]Why Originators Do Asset Securitization?